Snap Traps: These good old snap or spring traps have been around for decades and are still a favourite choice which can be very effective if used properly. Glue Traps: These are more controversial and have been disallowed in some areas. However, they are economical, effective and easy to use. Glue traps can be very handy to use in combination with traditional snap traps, especially if the mice have been evading capture. Some mice have learned to jump over snap traps, but a strategically placed glue trap could be just what is needed to get a hold of them. Homemade Traps: Then you get all manner of homemade traps such as the bucket trap or cage and box traps. Large buckets can accommodate a good number of mice, so this a great option if you want to leave the bucket set up while you are away, for example if you have a holiday cottage in the woods. No Kill Traps: If you go for the ‘live mouse’ capture-and-release option, you need to be prepared to travel at least 3 to 5 miles before releasing the rodents. Next you need to be bait-wise. Contrary to traditional beliefs, a chunk of cheese is not always the best bait. In fact peanut butter or hazelnut spread is a much more popular option with the mouse population who are primarily nut and seed eaters. Wear gloves: remember to wear gloves when you handle the trap and apply the bait, as your human scent may warn off the mice. Not too much: Don’t put a big quantity of bait in the trap; about the size of a pea is adequate. If you put too much they may end up nibbling the bait without actually activating the trap. Non-food options: Another way to lure the mice is by placing soft nesting materials on and around the snap trap, such as cotton balls or wool. Mice are generally nocturnal, so the best time to set your traps is in the late afternoon or evening. This way you have the whole night ahead for a good catch. If you are using snap traps, you might like to reset them after each catch, thus maximizing your harvest. Also, when you have had a successful catch, the scent of the mouse will now be on the trap and this will automatically attract other mice. An important part of knowing how to set a mouse trap is finding the right place to put it. Putting it in the wrong place is an easy mistake to make, so you might need to do a bit of research around your house first to ascertain exactly where the mice are most active. In other words, you need to identify the rodent zones in your home, especially the pathways between the nesting areas and the food sources. The clues you are looking for are droppings, chewing marks, musky smells near nesting areas, and of course sightings of the actual mice. Don’t forget to look in concealed corners, under and between furniture, even in desk drawers and closets. You may have heard scratching or squeaking noises in the ceilings or wall spaces, especially near heat sources. And don’t forget to check the attic, basement and garage areas. Don’t place traps in the center of the room – always keep them along the perimeters against the walls. This is because mice do not have good eyesight and they use their whiskers and body hair to navigate as they run along next to the walls. They also try to avoid wide open spaces, preferring to be in dark and concealed areas. With snap, or spring traps you need to make sure that they are positioned at right angles or perpendicular to the wall, not parallel with the wall. The bait and trigger end of the trap should be nearest the wall, so that when the mouse comes running along from either direction it will encounter the bait and successfully activate the trap. 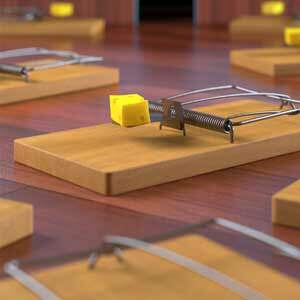 This is the biggest mistake people make when they don’t know how to set mouse traps properly; thus resulting in an escape mice and a stolen bait. The next question you are probably asking is how many traps do I need to set? By now you should have some idea of how severe the infestation is, judging by the amount of droppings and other signs you are seeing around your home. But remember, mice tend to breed at an intense rate of up to six or seven babies every three weeks, so literally as we speak they could be multiplying rapidly. Therefore, the best strategy is always to use a multi-pronged approach, with at least six traps, and even several different types of traps so you can see which ones are more effective in your particular situation. Place the traps next to each other at close intervals along the walls. As with most things in life, when trapping mice it is important to get off to a good start. Plan your debut carefully and then go all out from the very first night. This was the single biggest mistake I made on my first attempt to get rid of mice because I did not know how to set mouse traps correctly. I missed out on a good opportunity to catch a bunch of them at once. Why is it so important? Apparently mice are quick learners and good communicators, so once the word gets out that there are traps about they could start hopping over them or using other avoiding tactics. So start big, with an adequate variety and quantity of traps all over your house in the relevant affected areas. Once you have made the right start, things should only get better from then onwards. Now that you are aware of the seven ‘right’ things to look out for, you are well on your way to getting top marks for knowing how to set a mouse trap. All that remains is to get going and do it – the sooner the better, so that you can take back your space and enjoy a rodent free zone as you relax alone at home with your human family and friends. Keep in mind that traps aren’t the only way to get rid of mice; there are other options available as well.